Dogs often steal the spotlight when it comes to tricks because cats are "misunderstood when it comes to training, enrichment and living a happy and healthy life indoors," says Cary Rentola of the Larimer Humane Society. You may not be able to teach an old dog a new trick, but you can teach your cat tricks commonly associated with dogs. 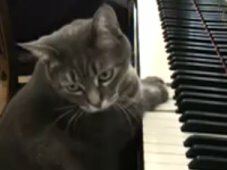 How Can Cats Play the Piano? Many try to become Internet and YouTube sensations, but most fail. Piano-playing cats, however, have succeeded where others have fizzled into obscurity. It’s not quite Mozart, but it’s music to animal trainer Miriam Fields-Babineau’s ears when Chewy tickles the ivories on his child-sized baby grand. On her cue, the Bengal cat plinks the keys at random, using both front paws. Teaching your cat to lie down on command is a "table top" trick. It helps if you have already taught your cat to sit on command. Your goal is to have your cat lie down when you give the command "down." Responsible cat owners will find that teaching your cat to walk on a leash has important safety benefits. With the dangers of dogs, disease, cars and unwanted kittens, having your cat on leash when he’s outdoors is a good way to ensure she live many happy, healthy years. Sitting up, like the dog trick "beg," is one of the simplest behaviors you can teach your cat. Cats often assume this position naturally. Your goal is to have cat sit up on his haunches when you give the command "up" while you hold the food reward above him-and eventually on the command alone. Cats scratch. There’s no getting around that fact. Scratching serves some very important purposes for cats, so the answer to any scratching problem is to give your cat an appropriate place to scratch, and then redirect his claws when he scratches someplace that’s not appropriate. The key to keeping your cat off the kitchen counters is to make them undesirable places. If your cat has already discovered that there are sometimes tasty food treats on your counters, it will take some retraining to convince him that it’s not worthwhile to leap up there whenever your back is turned. 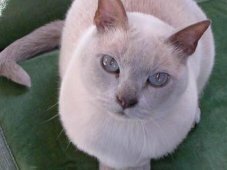 Can you train your cat to do behaviors on command? The answer is a resounding "Yes!" But, you say, your cat is independent, stubborn and will condescendingly turn up her whiskers at anything resembling a command. In fact, if cats could laugh, yours would be rolling on the floor this very minute (which he undoubtedly is doing). We cat lovers know that cats are exquisitely intelligent animals. But what, exactly, does intelligence imply? Too often we carry around a stereotypical view in which dogs are trained and cats are… well, pampered. But training cats can be useful and even fun, both for us and for our fabulous felines. 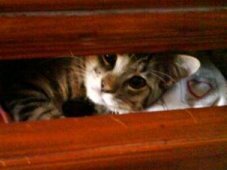 You start teaching the "come" command by calling your cat to come for a meal. He probably already comes to you for food, so starting this trick is easy. This command is a foundation for many other ticks and behaviors. Your goal is to have your cat sit down when you give the command "sit".